Ball's Ferry Landing has been designated as a site on the March to the Sea Heritage Trail. 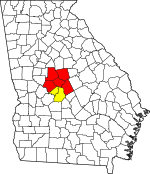 Wilkinson County, established in 1803 and named for General James Wilkinson (1757-1825), is a county located in the U.S. state of Georgia. As of the 2010 census, the population was 9,563. The county seat is Irwinton. The county was created on May 11, 1803. According to the U.S. Census Bureau, the county has a total area of 452 square miles (1,170 km2), of which 447 square miles (1,160 km2) is land and 4.6 square miles (12 km2) (1.0%) is water. The entirety of Wilkinson County is located in the Lower Oconee River sub-basin of the Altamaha River basin. As of the census of 2000, there were 10,220 people, 3,827 households, and 2,805 families residing in the county. The population density was 23 people per square mile (9/km²). There were 4,449 housing units at an average density of 10 per square mile (4/km²). The racial makeup of the county was 57.96% White, 40.70% Black or African American, 0.21% Native American, 0.07% Asian, 0.40% from other races, and 0.66% from two or more races. 0.99% of the population were Hispanic or Latino of any race. There were 3,827 households out of which 33.70% had children under the age of 18 living with them, 50.60% were married couples living together, 18.40% had a female householder with no husband present, and 26.70% were non-families. 24.10% of all households were made up of individuals and 10.40% had someone living alone who was 65 years of age or older. The average household size was 2.65 and the average family size was 3.13. In the county, the population was spread out with 27.20% under the age of 18, 9.00% from 18 to 24, 28.10% from 25 to 44, 22.70% from 45 to 64, and 13.10% who were 65 years of age or older. The median age was 36 years. For every 100 females there were 90.60 males. For every 100 females age 18 and over, there were 88.10 males. The median income for a household in the county was $32,723, and the median income for a family was $39,349. Males had a median income of $31,814 versus $21,461 for females. The per capita income for the county was $14,658. About 14.60% of families and 17.90% of the population were below the poverty line, including 24.90% of those under age 18 and 18.00% of those age 65 or over. As of the 2010 United States Census, there were 9,563 people, 3,666 households, and 2,638 families residing in the county. The population density was 21.4 inhabitants per square mile (8.3/km2). There were 4,487 housing units at an average density of 10.0 per square mile (3.9/km2). The racial makeup of the county was 58.5% white, 38.4% black or African American, 0.3% Asian, 0.3% American Indian, 1.3% from other races, and 1.1% from two or more races. Those of Hispanic or Latino origin made up 2.2% of the population. In terms of ancestry, and 14.7% were American. Of the 3,666 households, 33.6% had children under the age of 18 living with them, 47.9% were married couples living together, 18.3% had a female householder with no husband present, 28.0% were non-families, and 24.8% of all households were made up of individuals. The average household size was 2.58 and the average family size was 3.06. The median age was 41.1 years. The median income for a household in the county was $37,902 and the median income for a family was $49,138. Males had a median income of $39,009 versus $25,935 for females. The per capita income for the county was $17,929. About 17.9% of families and 23.1% of the population were below the poverty line, including 35.1% of those under age 18 and 21.9% of those age 65 or over. Wilkinson County is home of the 9-time state high school basketball class A champions. This page was last edited on 9 February 2019, at 15:56 (UTC).